Introduced in 1999, and continuing to grow every year, the Michigan High School Skating series offers great opportunities for skaters to participate in team sports and to be part of their school's athletic program. Starting with 10 teams and a single competition in 1999, the 2018 series has 39 teams and 19 competitions. 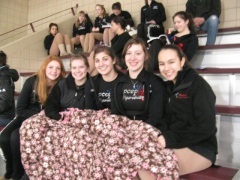 High School Figure Skaters in Michigan compete in 6 Districts, each composed of 6-12 teams. Each school may field any or all of "A", "B", and "C" level teams, which compete separately. The "A" teams have the most difficult elements, "C" teams have the least difficult. Teams participate in 3 initial-round competitions within their own District, then the victors from each district meet in a final State Championship Competition in March. The initial-round competitions in each district are Team Compulsory competitions. At these competitions, there are 3 events at each level - a Jumps event, a Spins event, and a Moves event. Each event has 4 "elements" - elements are performed by a single skater from each team, in team rotation. Each competition lasts about 4 hours, and teams compete against other teams within their own district to earn a position in the State Championship competition. The 2-day State Championship offers a final Team event in the same format as described above. It also offers a large variety of "Individual" events such as freeskating, dance, and showcase which allow skaters to earn State Individual medals.